Hello guys from Charleston, WV. Interesting reading and pictures here. Things are done differently it seems up north. I have a good friend who lives near Pottsville (I Think) he works at Quadratec. Welcome to the forum. Its always nice to have members from active mines in other areas to contribute to the forum and discuss their areas and ways of doing things. Feel free to share any bituminous experiences from over in WV! If you need any info on your mines in West Virginia, Virginia, Kentucky, Ohio & Western Pa we have just about covered most mining complexes active & abandoned. We would be glad to help you out. The biggest problem in our area is that the roofs are usually pretty bad & BLACK DAMP has to be CLOSELY monitored. We are based out of Ohio. We have another trip this Friday, Sat & Sun going to Western Pa, West Virginia & the Tip of Virginia. We are going underground & have our hazard training at two of the active mines. Our last trip (2) weeks ago covered approx 1,600 miles in 3 days & over 50 +mines. We have not posted any pics or movies from this trip yet or any from our winter season. Ohio Underground Rail Coal Miners / Ohio Vintage Coal Co. Check out the Robinson Run mine pics. This mine is located near Shinnston, WV. This mine requires hazard training to enter the facility & the security is high because it is an active mine. Very cool place! I just noticed that this is the only pics that we have of coal mines in our area, I guess I will have to fix that. You said you had a friend that works at a mine in N.E. Pa but do you work at a mine. No he lives up there and works at Quadratec (4X4 supplies dealer) I live in Charleston WV and am a scoop operator/roof bolter at the Eagle #1 deep mine in Boomer WV. 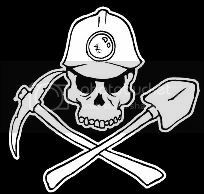 I had a video of a mantrip ride into the last mine I worked at Muira #1 at Slaughters creek I'll see if I can locate it. Yeah there are quite a few mines using longwall down here but we only have 1 to 1 1/2 years left at the mine I am at now then we will move up the hill to another seam with maybe 2 years there. I worked at Independence coal (Massey Energy) Last year they were running a long wall panel and 2 cont miner sections. Just got home from a night of moving belt. I am beat! Just saw the last part of your question. Just one fan we are a small mine. I have been there since we faced it up and made the first cut. Right now we are about 20 breaks in and I think we only have approx 75 breaks in with 7 left panels before we hit our mining limits in this seam. There are 3 mines on the property in 3 different seam. The hill was mined out back in the 70's-80's by a big union mine that was in there in the coal heyday. We are pretty much mining out what was left after they pulled out when coal prices fell and all the mines shut down. The first left panel we drove went about 6 breaks then the ribs started rolling out bad from taking on too much weight because we were driving towards the old works that are now abandoned. The 2nd left panel was aborted because no use moving the section only to hit bad ribs again. So we are going to drive straight ahead until we can turn left and be further away from those old works and maybe not take on so much weight on the ribs. There are reserves for 2 more mines on the property one will have a few years of coal in it and then another big one that is rumored to be about 25-30 years of coal. It's a small company who owns 10 strip mines and this is their first venture into underground mines and we are having our growing pains as you can imagine. But they pay GREAT and the benefits are top notch. As a scoop man I make $25.50 an Hr, 90/10 Health Ins is FREE Life Ins is FREE and we get every other Saturday OFF, Plus 2 weeks paid vacation, 5 personal days, 5 sick days. So it's not too bad at all. Plus since it's their first venture into underground mining all the equipment is brand new! "driving towards the old works that are now abandoned." Location: somewhere you are not! or would that be "seams"
all in fun boys all in fun. One of these days you to will be converted to bituminous ha ha ha The transformation will begin once you actually go into one of our "BIG" ACTIVE coal mines. We still have not had a chance to even get you guys hazard training yet I think that is why you guys hide out there. The time will come soon & you guys will be wanting 20 ton underground mine cars too!